Model T Ford Forum: Any Fordson Enthusiasts Here ? Any Fordson Enthusiasts Here ? Model T Ford Forum: Forum 2014: Any Fordson Enthusiasts Here ? 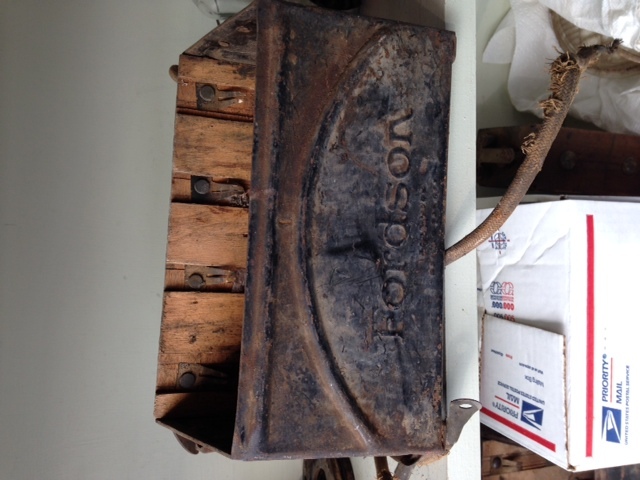 I picked up a couple Fordson coil boxes over the weekend and am inquiring to possibly date them - one has a rather large "arc" over the top of the "Fordson" imprint along with some smaller imprinted wording but it apparently takes the older ('17 - '25) lid. 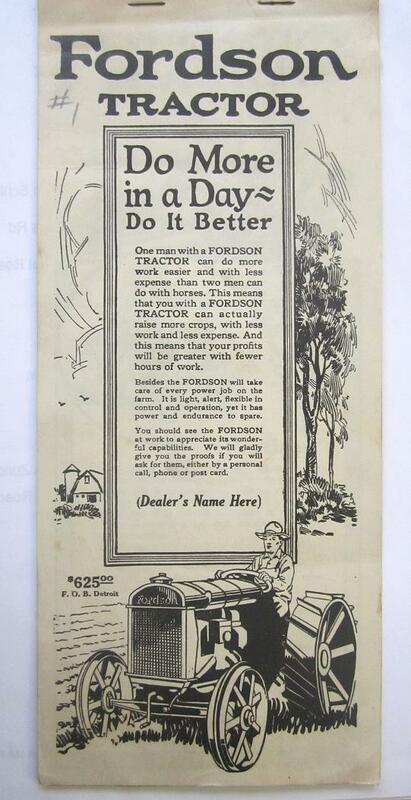 The other is just stamped "Fordson" and takes the '26 - '27 style lid. Any assistance is identifying year of manufacture would be appreciated ! I can possibly post a couple comparison photos later today. I am a Fordson enthusiast and have owned Fordsons in the past - in fact, I have been actively looking for the "right one" for a while. You are correct, the "half moon" coil box is the earlier box - and as I recall, it was only used in the first few years of production (maybe up to '20 or '22). They then went to the plain box for a few years and finally the plain box with the '26/'27 style cover. My '25 had a non-moon box and a standard cover (not a '26/'27 style). 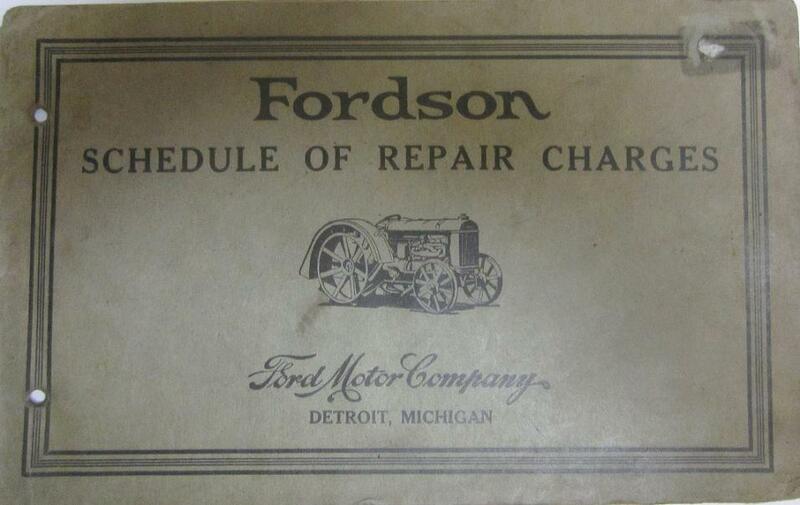 Fordson dating by components is always dicey - like the T, interchangeability of Fordson parts led to a lot of mixing. I have seen beautiful Fordsons that were clearly late production models (integrated kerosene & starter tanks, late coil boxes, Holley 295 vaporizers), but sported the "ladder-sided" radiators (which were used only in early year '17-'19). You two will like this photo. About 15 years ago, I ordered a set of coils for my '25 (long since sold) from Lang's. When I mentioned the coils were for a Fordson, they asked me if I'd like "tractor unit" ones? I said absolutely! 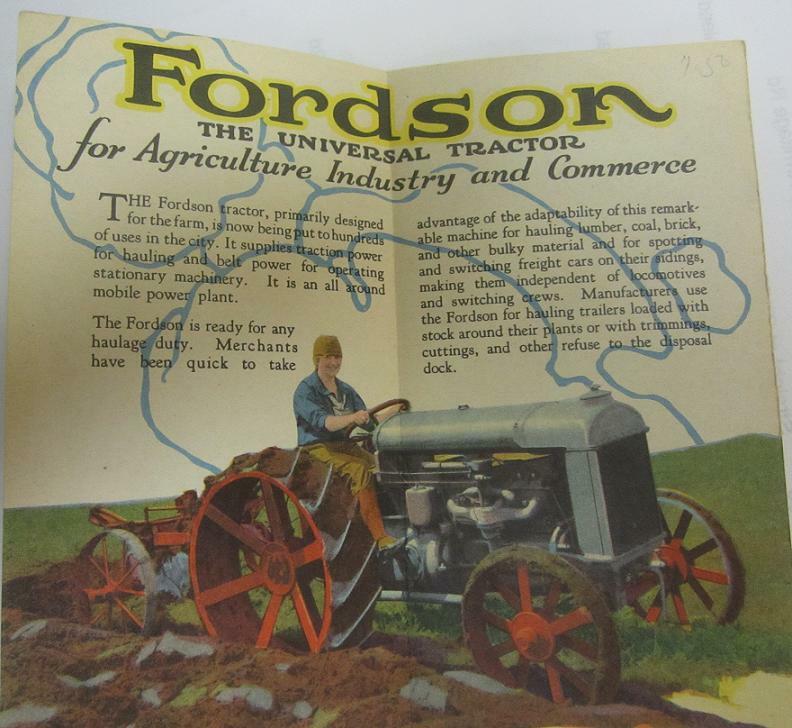 First I had heard that Fordson coils had a special marking. 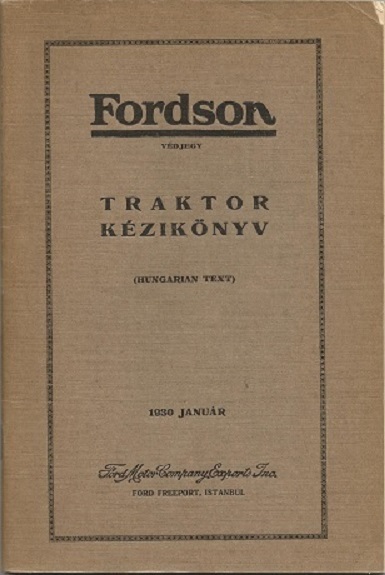 When the Fordson Tractor was introduced the ignition coil wood cases were marked "Tractor Unit" as shown in the photo above. 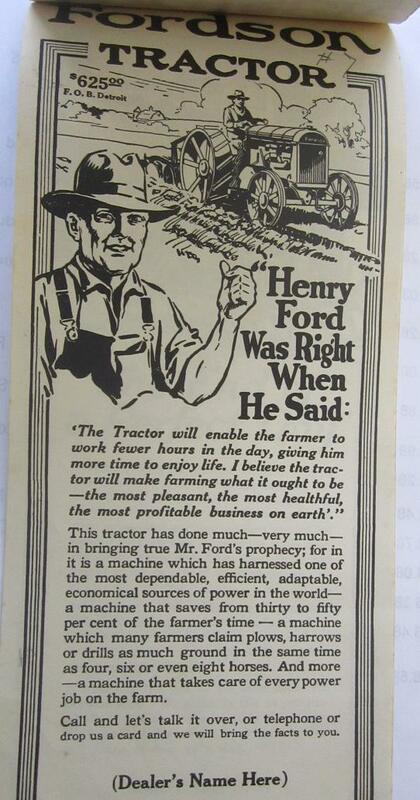 Because of the tractors high operating temperature Ford believed they needed coils with a slightly different capacitor value, higher melting point potting material and larger point contacts. This required two coil manufacturing lines, many additional part numbers and, as I recall, only lasted a few years. 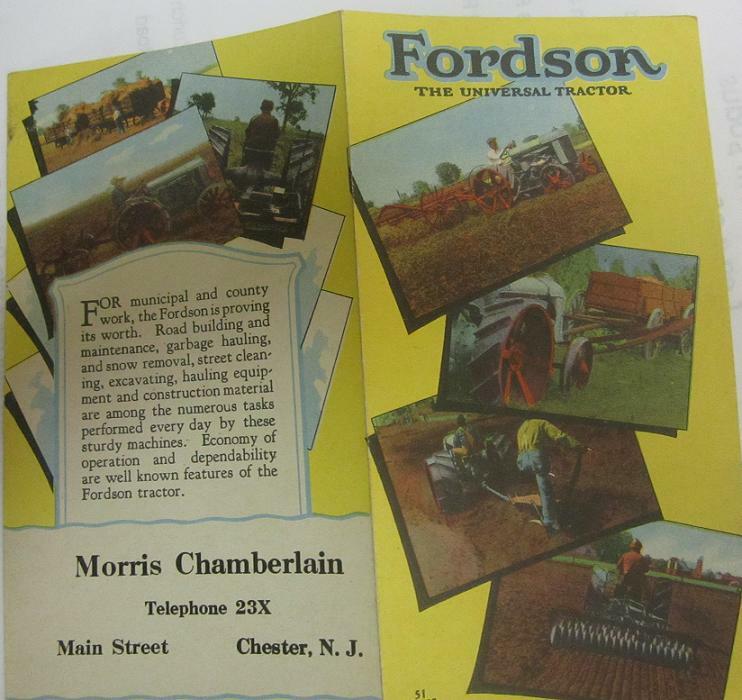 Ford then standardized upon one coil and was used for both the Fordson Tractor's and Model T's. I wouldn't call them rare, but you do not see many of them. I see about 5 of these coils a year in my shop. Thanks for the info, Gents ! 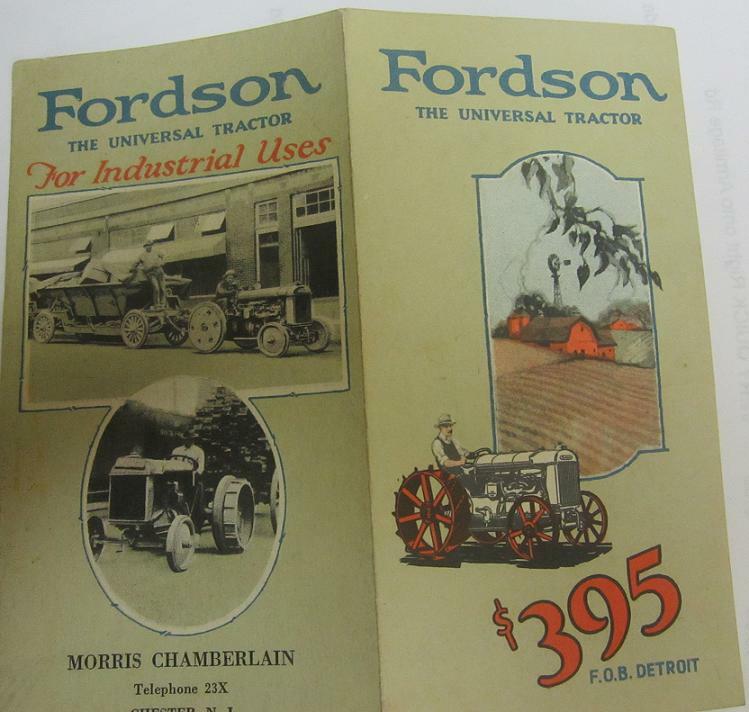 Both of these have "Fordson" imprinted. Both could be available - the later one has the lid and I could probably find an 'orphaned" lid for the early one. Steve - by "plain" I mean without the half moon. 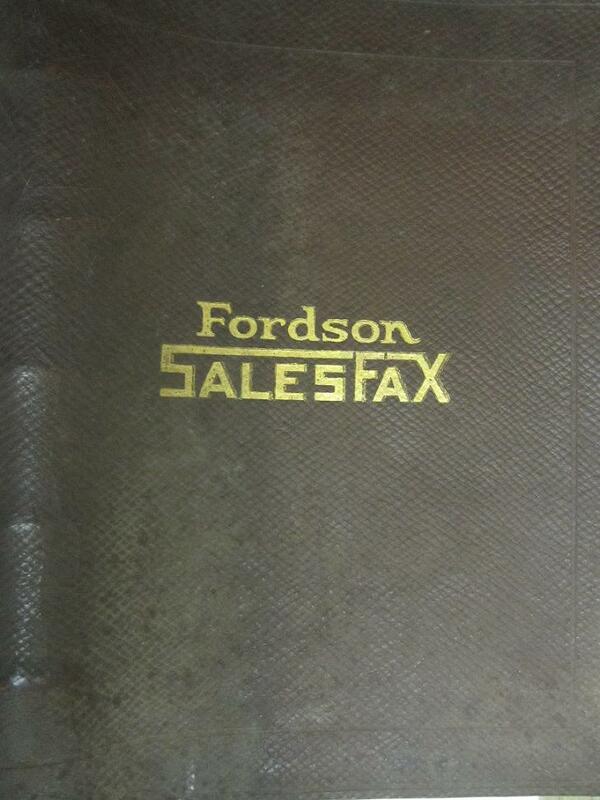 All the Fordson coil boxes have "Fordson" stamped on them. Another rare Fordson component is the toolbox with the very small Fordson lettering. This is a very, VERY early toolbox. Thanks - Learn something new everyday ! 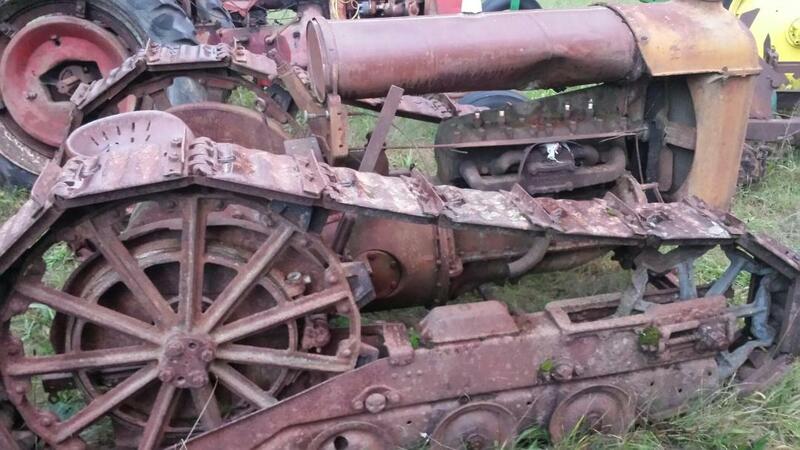 Here's a picture of my unusual Fordson an enthusiast might find interesting. Neil - I am so envious! I spent 20+ years on tanks; I would LOVE to find a Trackson (would sort of the best of both worlds)!!! She is beautiful!!! Wow, that is cool. Never seen anything like that before. Sounds like Ron needs a Christmas present for himself, LOL. Chad - I would be thrilled to find that under the tree/in the garage. There's an older gentleman that I run into at the tractor shows around here who has a Trackson. He's owned it for 50 years+. 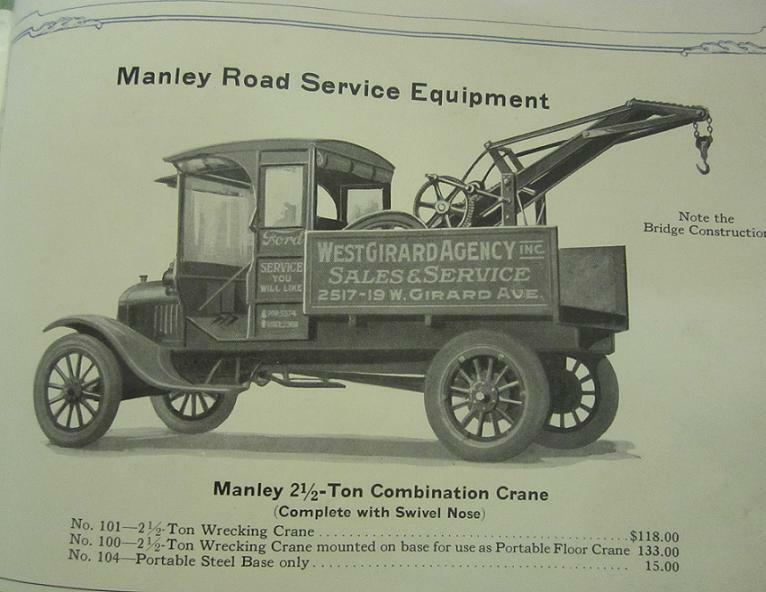 It was originally used by the Framingham Public Works Department. Absolute joy to watch in action and I never tire of looking at it. Neil's is absolutely perfect!! 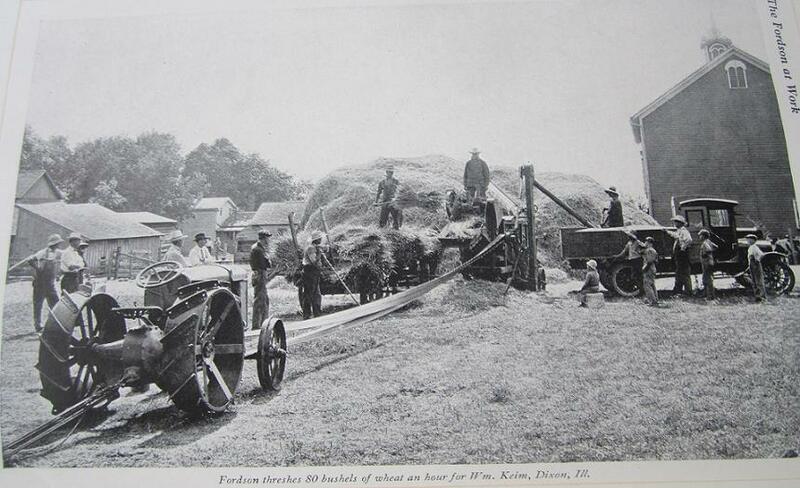 Lavina and I recently donated a 1918 Fordson Tractor with a early Ferguson plow to the MTFCA Museum. I and my very talented helper Tom Bartlett are basically working full time on Museum projects. 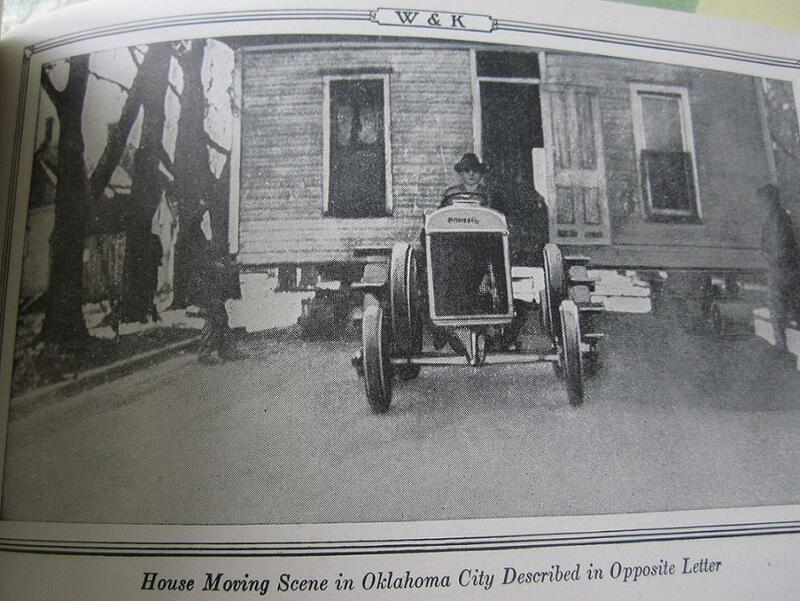 Currently,we are replicating from photos a 1914 War I Ambulance that was assigned to the American Hospital in Paris. 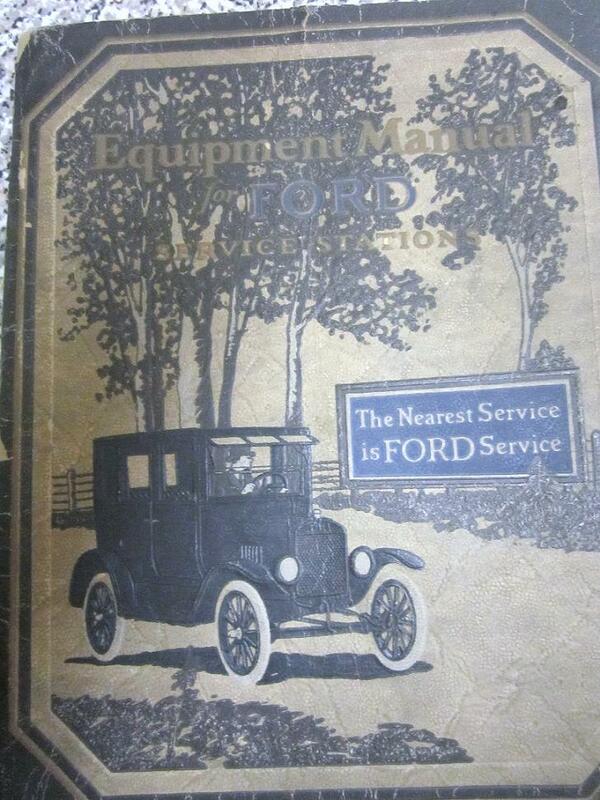 100 Model T Fords were donated by the Ford Motor Company for the project. 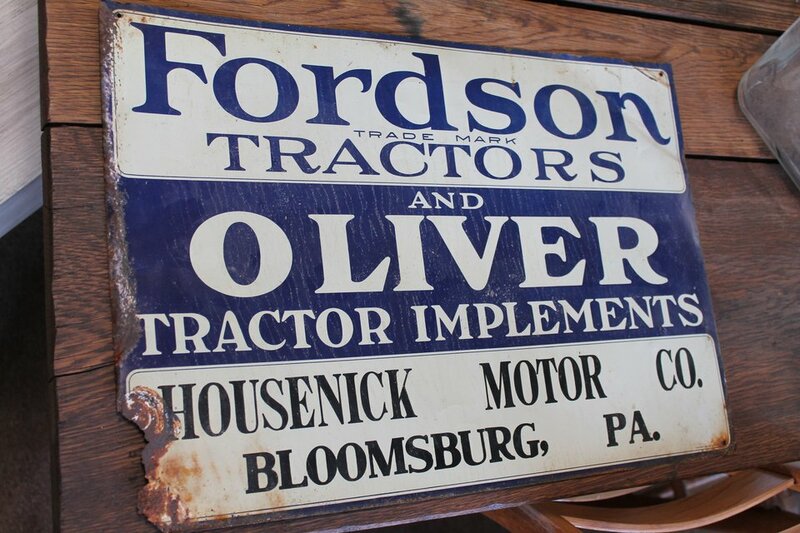 Projects that we would like to purchase and restore for the Museum are a Fordson Trackson and a Ferguson plow designed for the Model T tractor conversions. This appraisal was prepared for the purpose of Federal Estate Tax valuation to support Fred and Lavina Houston�s claimed deduction for the charitable contribution of property worth more than $5,000. This donation includes two rare historical items; a first year Fordson tractor and a proto- type two-point hitch Fergeson plow designed for the Fordson tractor. The Model F Fordson tractor, serial number xxxxx, was manufactured in December 1918; the year that �Henry Ford and Son� named their new tractor, Fordson. 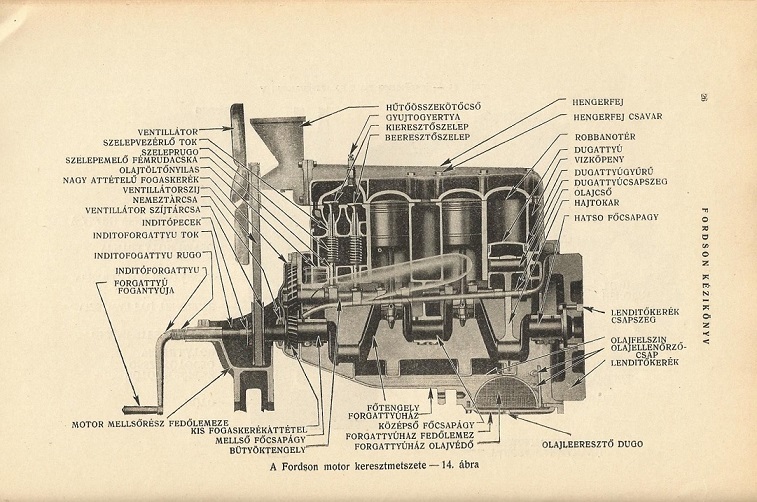 The first year 1918 Fordson was unique in many ways from those that followed; including the ladder sided radiator, coil boxes taken directly from the Model T Ford automobile, unique radiator and oil caps, and unique early carburetors. Also unique was the fact that all the primary castings were date stamped. Since this tractor was kept in a shed, the original all- wood steering wheel has been preserved. Some original Fordson accessories are installed on the tractor; they include belt pulley side drive, the rear wheel width extenders for sandy fields, a complete set of Fordson tools in the tool box and a duplicated canvas engine cover. 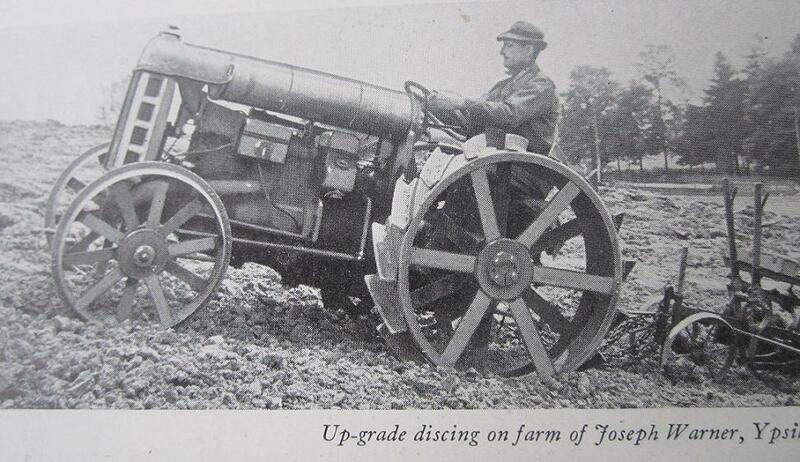 Early Fordson tractors had no brakes. 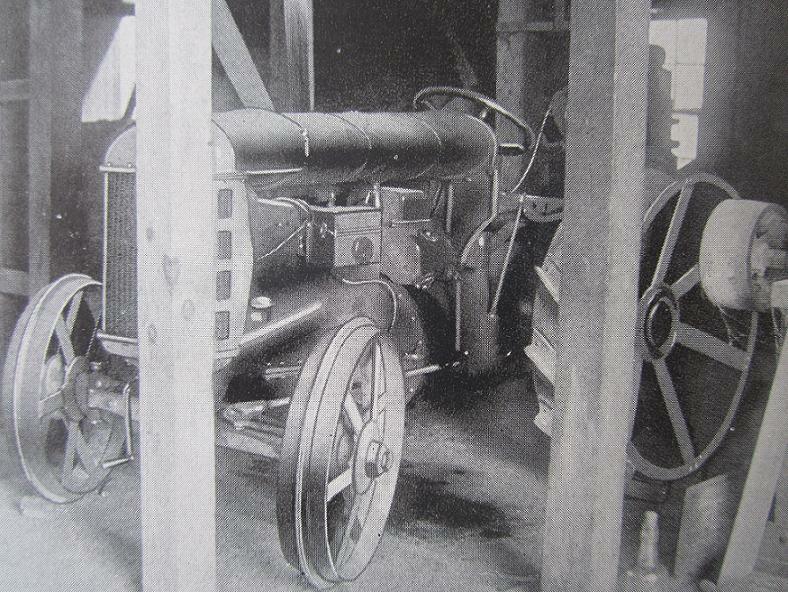 Brakes were added to the new Fordson�s about May 1923. At that time, at conversion kit was made available to add brakes to earlier Fordsons. These brakes have been added to the museum tractor. 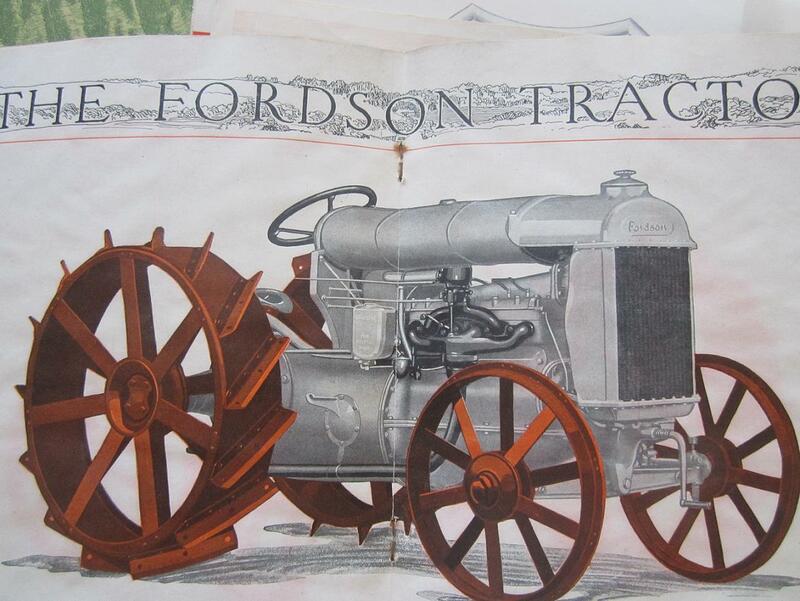 Also included for display are two after-market versions of Fordson Governors. These mechanical governors were important because the Fordson engine was red-lined at 1000 rpm, and continuous operation above 1000 rpm would shorten the life of the engine. Henry and Edsel�s wonderful Fordson tractor had one deadly drawback; when hitting something solid in the field, the tractor had a tendency to �rear up� and kill or injure the driver. 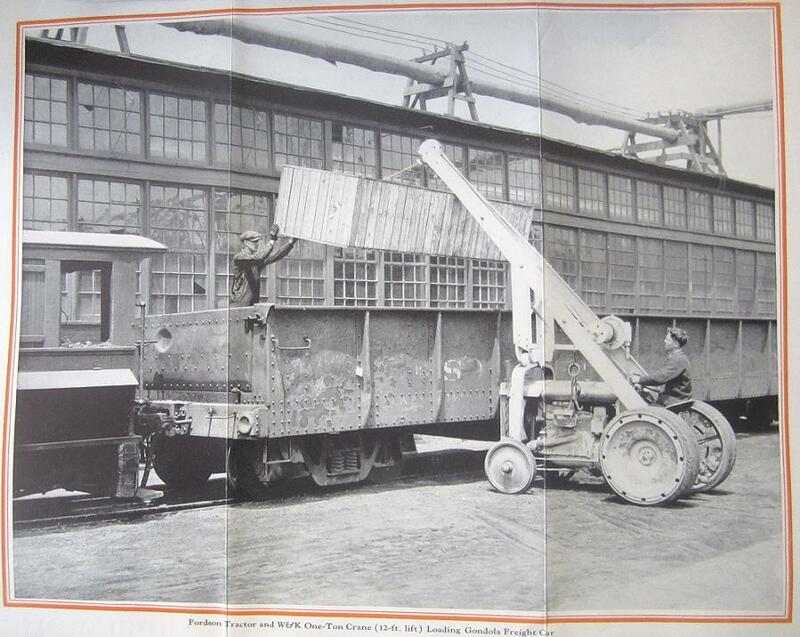 This problem was not solved until 1923 when very heavy duty fenders were installed which prevented the rearing. Interestingly, this problem would have been solved if only Henry and Edsel had adopted the revolutionary new Fergeson plow with the two point hitch! The historical significanse of this Fordson tractor is further enhanced with the information that by 1925, over 500,000 fordson tractors had been produced and � of all the tractors in the country were Fordsons! This Fordson was completely disasembeled in Fred Houston�s Model T Garage and all worn parts were either repaired or new parts were used. This tractor now performs like a new tractor, direct from the factory. 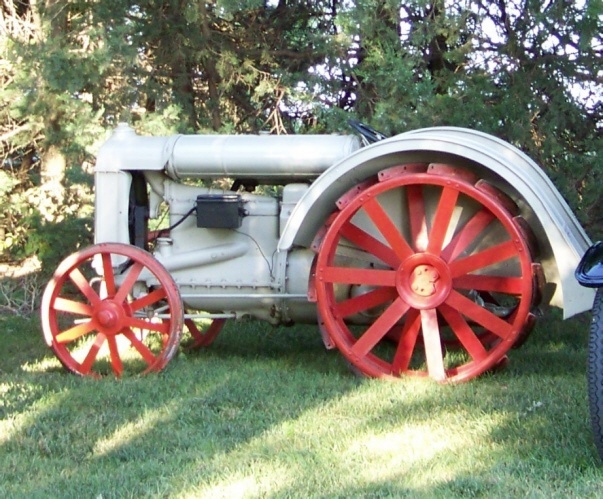 Fergeson�s 1919 proto-type Fordson plow with two-point hitch was truly ahead of it�s time; forerunner of the three-point hydraulic version, which was to follow in 1939. 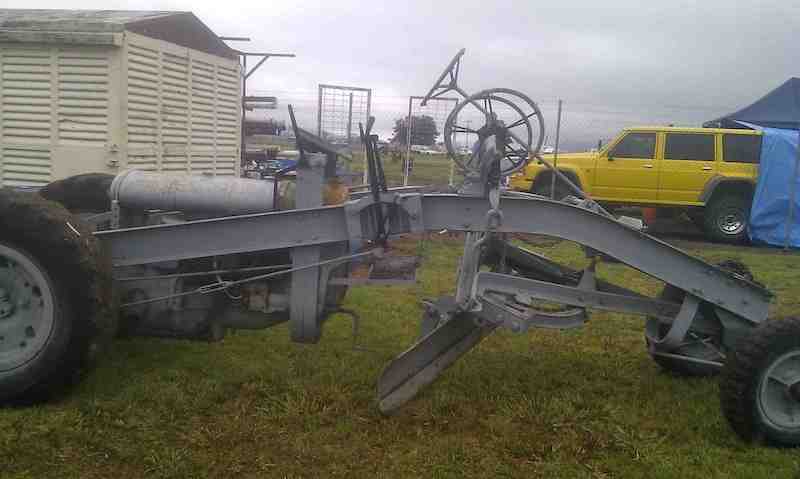 �Revolutionary� would be a good way to describe this new Fergeson plow. All other two bottom plows of the day had two wheels, this one has none. 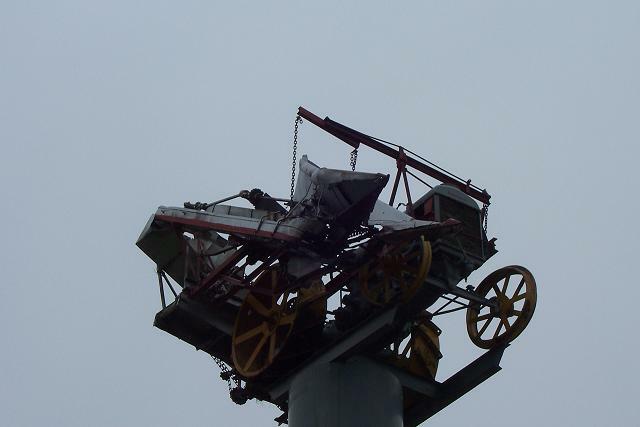 Powered by a large spring, and controlled by a single lever, the tractor driver is able to easily drop the plow into the soil, or lift it from the soil. 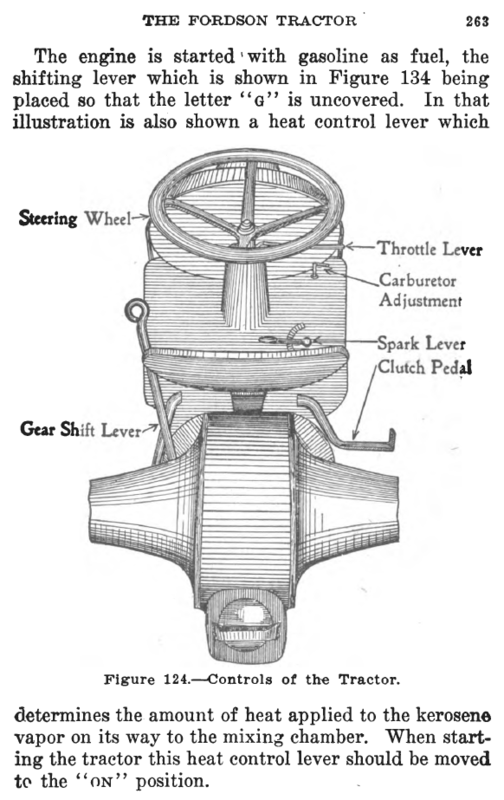 By 1923, another lever had been added to allow the driver to easily control the depth of the plow. This is the only proto-type version known to exist. 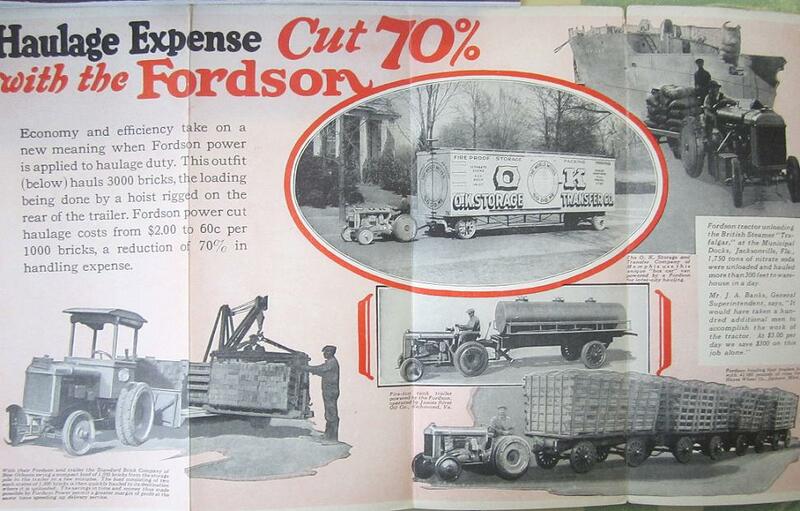 If someone had a very early Fordson coilbox - the Henry Ford needs one for Fordson #1. At least they did in August of 2013 when I visited. 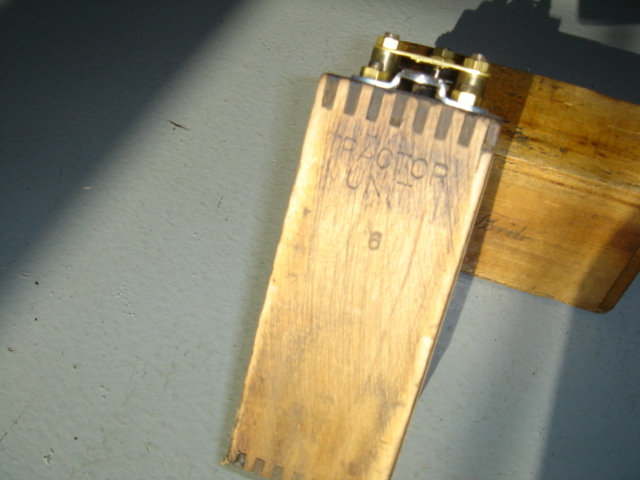 I have the correct coilbox on my '19 ladder side Fordson and would donate -for casting - the cute little forged (cast?) pieces that mount the box to the engine so we can complete their historical tractor. Ron, thanks for the 'Trackson' terminology. Now I also know what I want to look for. 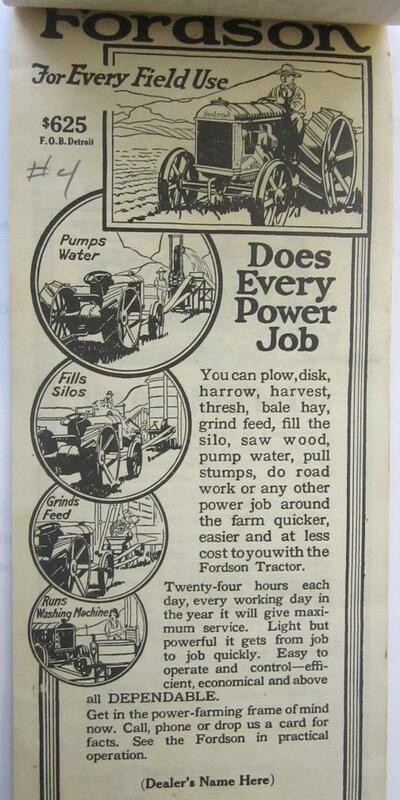 . . .and I'm looking for an Oliver #7 plow which, I'm told, is considered "period" for my Fordson. 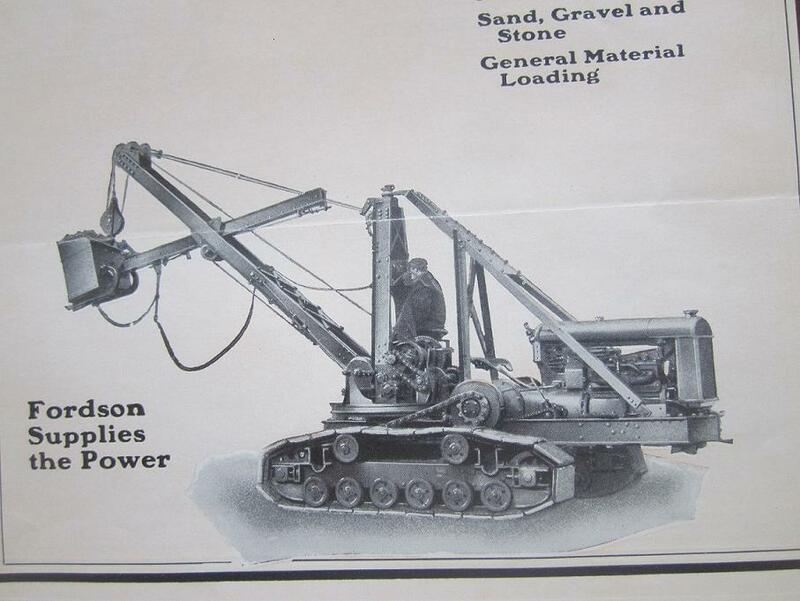 There were several crawler kits made for the Fordson. The actual Trackson kit had a plate that said "Trackson" that was affixed to the tension mechanism located between the drive sprockets. 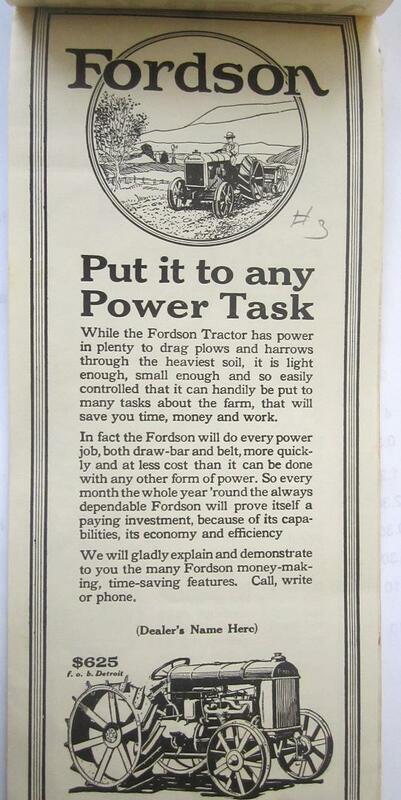 I use Trackson to describe any Fordson crawler (and I'd be happy with a Fordson that had ANY one of the kits). Ron, it is indeed a Trackson conversion. Another plow that would be period correct for a Fordson is a John Deere #4. 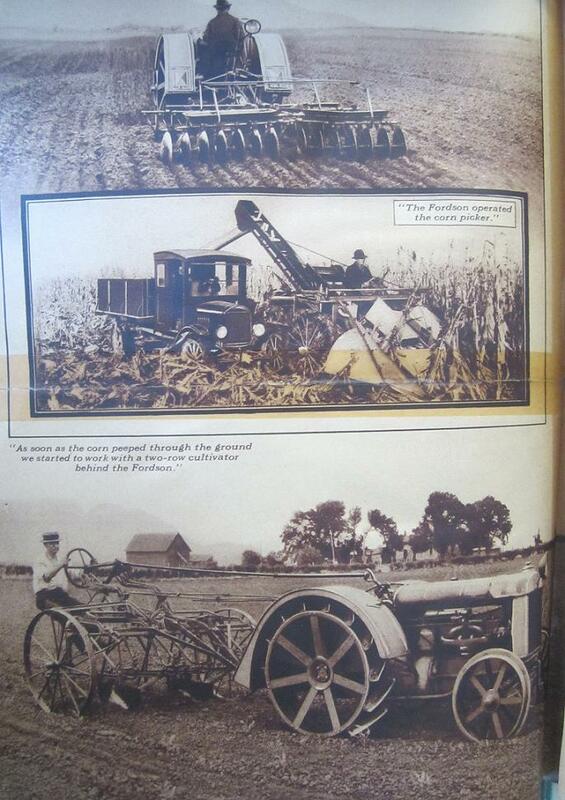 I have a John Deere Plow Company general catalog #32 that shows Fordsons pulling various implements including the #4 plow. 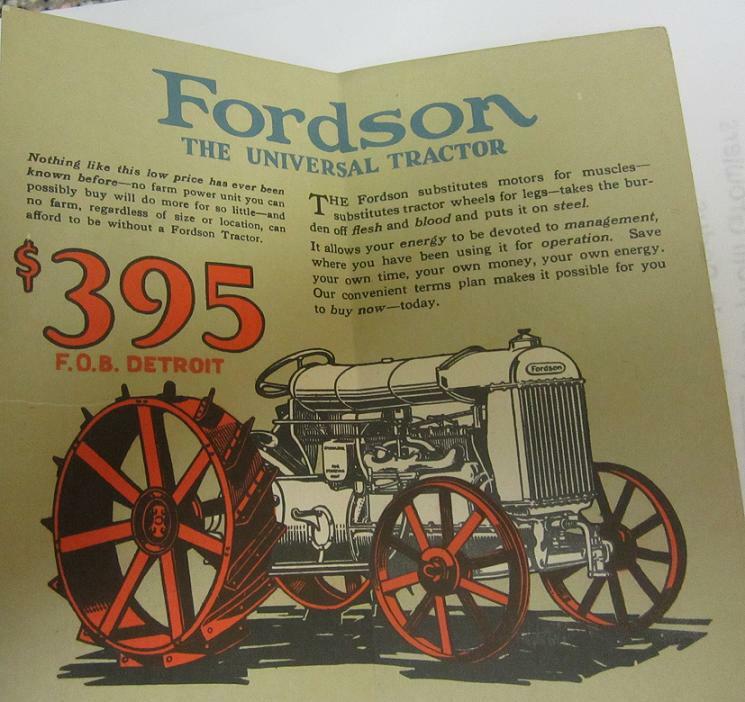 Ferguson eventually made more than 14,000 Fordson plows. I have a list that shows the plow number each time a new Ferguson patent was introduced. there were 40 patents or so. 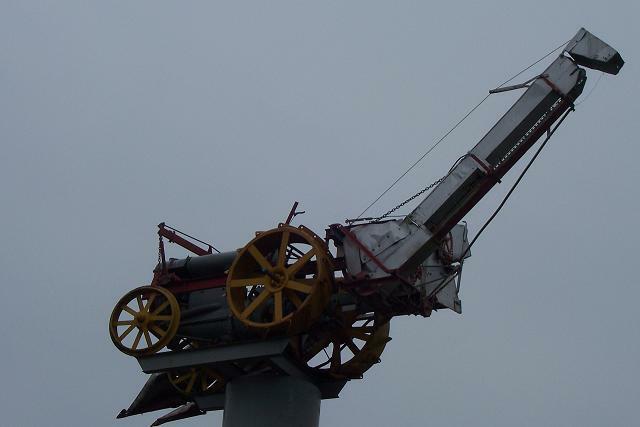 The Museum plow is serial number 1806, only one patent from the beginning patent which was in 1919. The Spokane Model T Club has an interesting video on a Model T tracked tractor that a club member restored several years ago. Click on the link and see what fun our club had driving this tractor. How cool is that ?????? As a "retired" Operating Engineer (40 year pin in 2014) that is just a smidge smaller than the D7 & D8 dozers I used to play with but I'd love to have a little crawler like that or a Trackson ! I obtained a Fordson coil box, motor mount in a lot of Model T items from a seller. 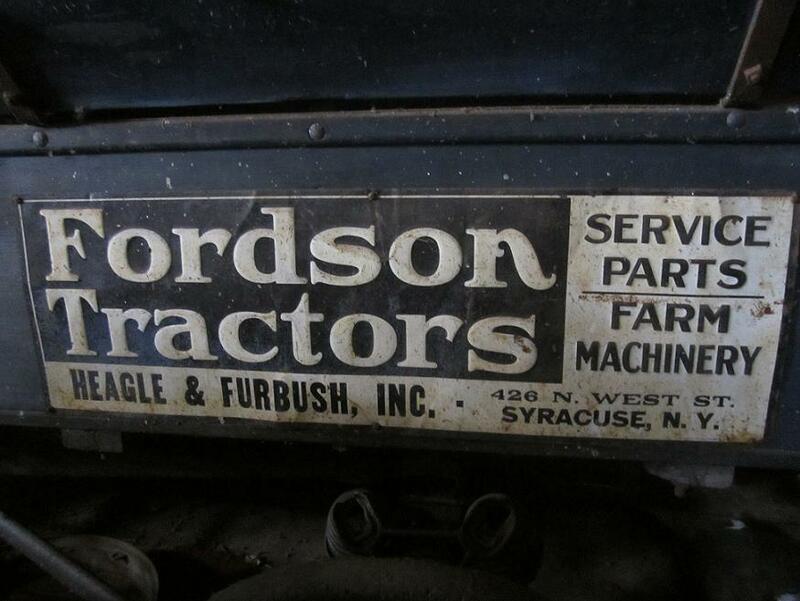 This coil box has Fordson logo on the front and an arc over the top of the logo. The wood on the back has some of the original wires and the wood is in poor shape overall. No lid. The metal looks good overall. From the conversation this sounds like an earlier coil box. That's looks like one of the 2 I picked up last weekend. Earliest Fordson coilbxes have the switch on the outside (like an earlier T). Earliest pictures of the crescent-stamped boxes I can find date from around 1920. 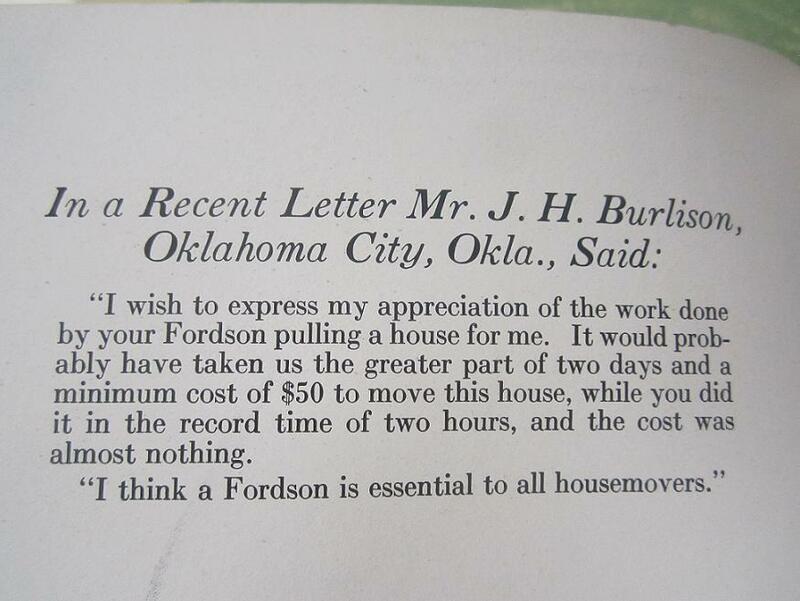 To George House regarding coil box for Fordson number one. 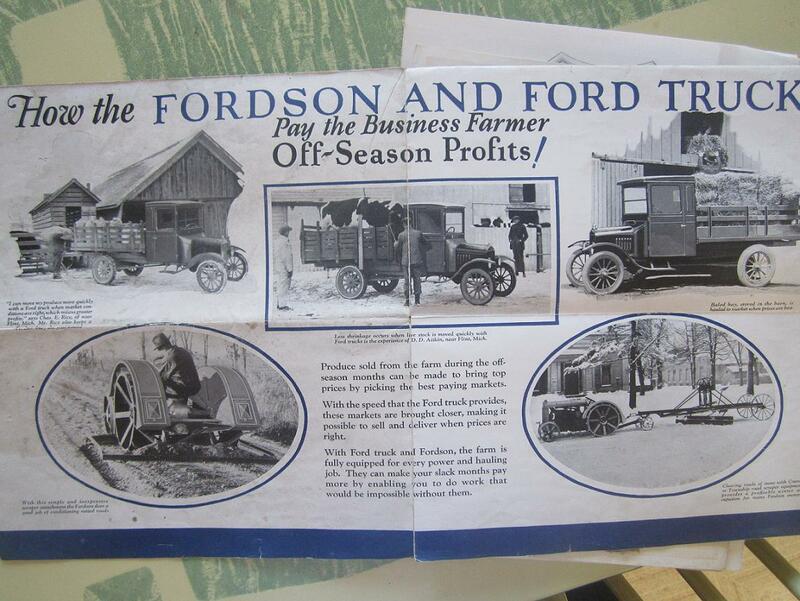 Is this experimental number one or the first production Fordson? Either way my understanding is that the Model T coil box the year of manufacture was used thru 1918. I'm not quite sure when Fordson boxes were introduced. 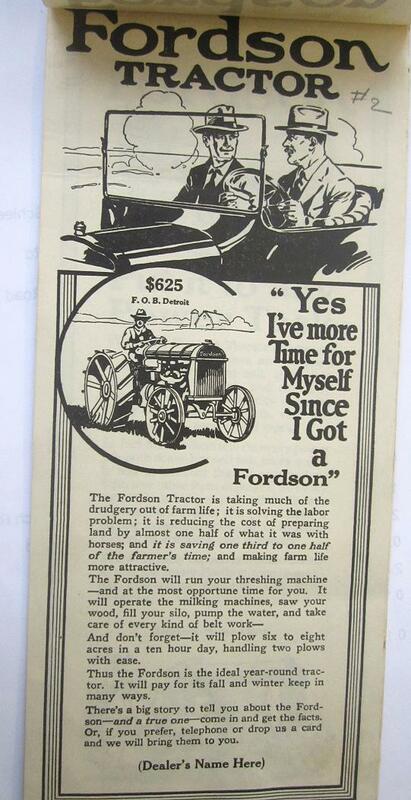 The 1918 Fordson is commonly called first year of manufacture. This is not quite true. 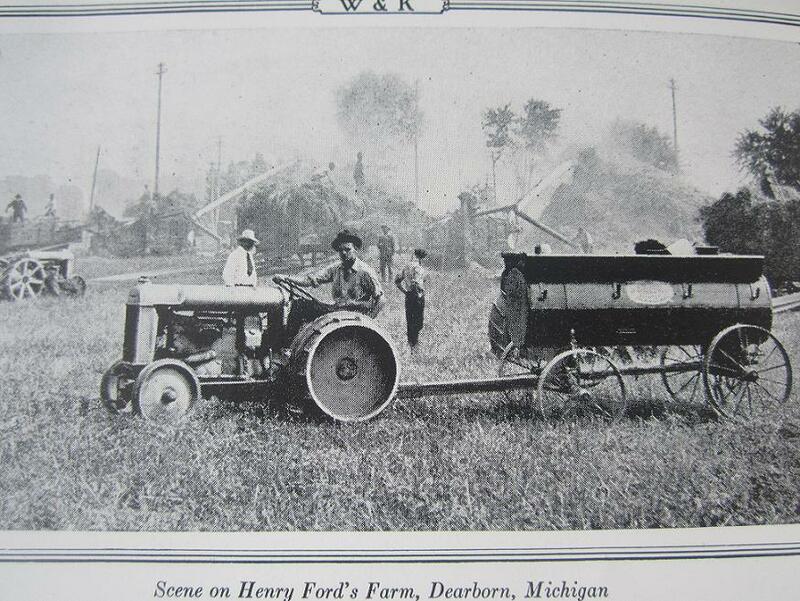 258 Henry Ford & Son tractors were produced in 1917. 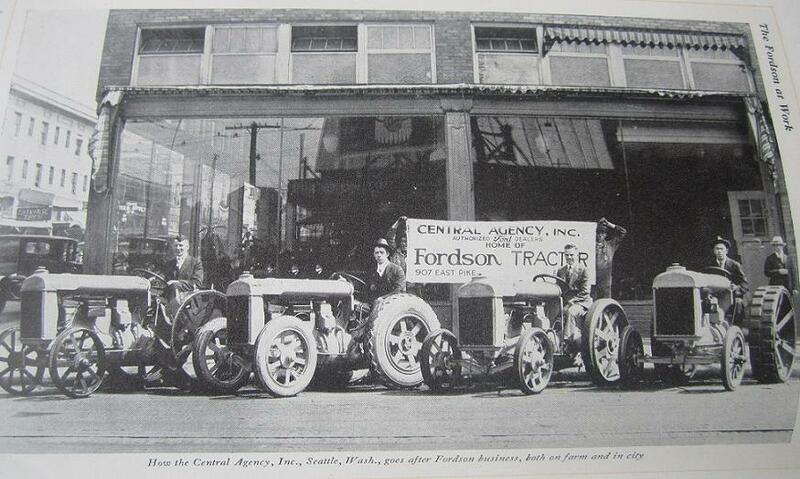 These tractors did not have the "Fordson" name which was added in April, 1918. THese earlier production tractors are called MOM's, short for England's "Ministry of Munitions", where most were shipped. 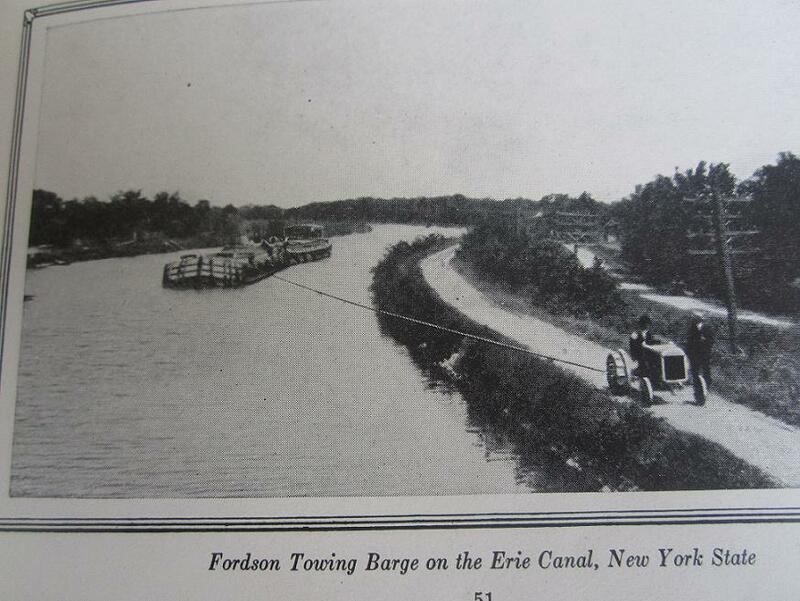 I have a collection of Fordson literature. Attached are a few pictures, if anyone is interested, I can post more. 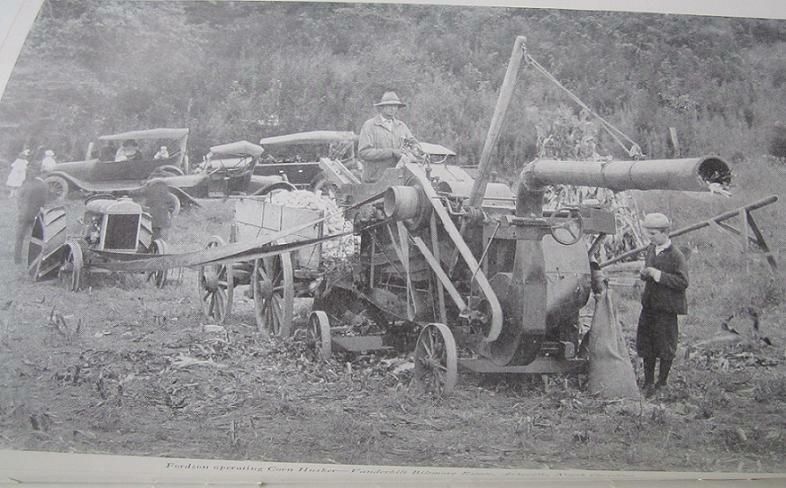 Here is a picture of a " Wehr- Fordson " Grader at a machinery show here in Australia. This one is on Pneumatic Tyres. Perhaps a later version. Ron, were the early coil boxes mounted up on the firewall like the early cars, or were they motor mounted? All were mounted on the engine. 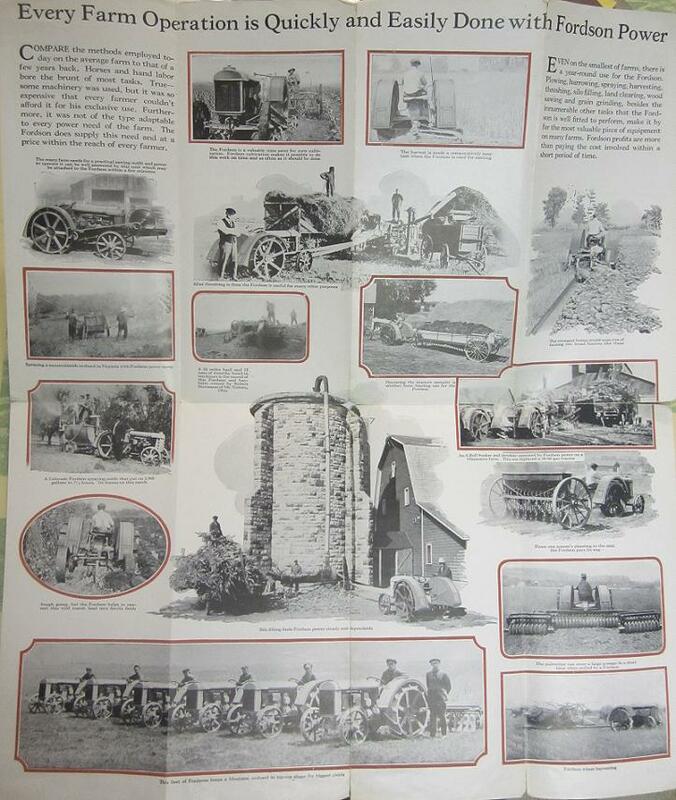 More pics for the Fordson enthusiast. 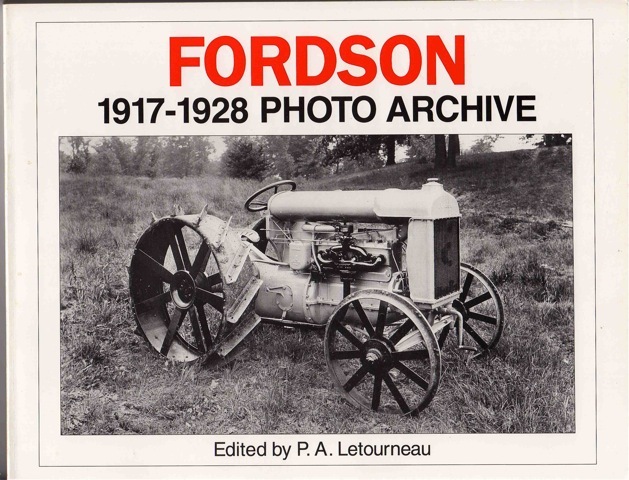 "FORDSON 1917-1928 PHOTO ARCHIVE." A lot of excellent pictures there also. 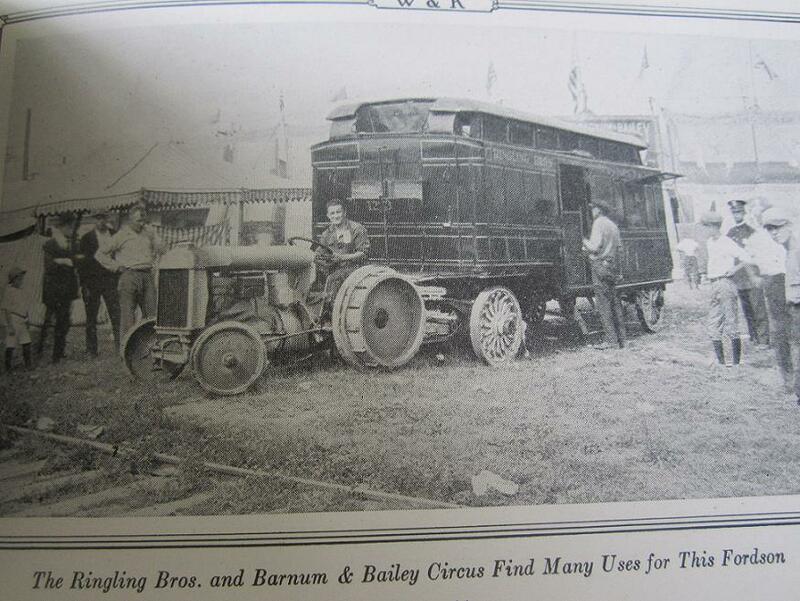 Particularly the early Experimental Tractors. 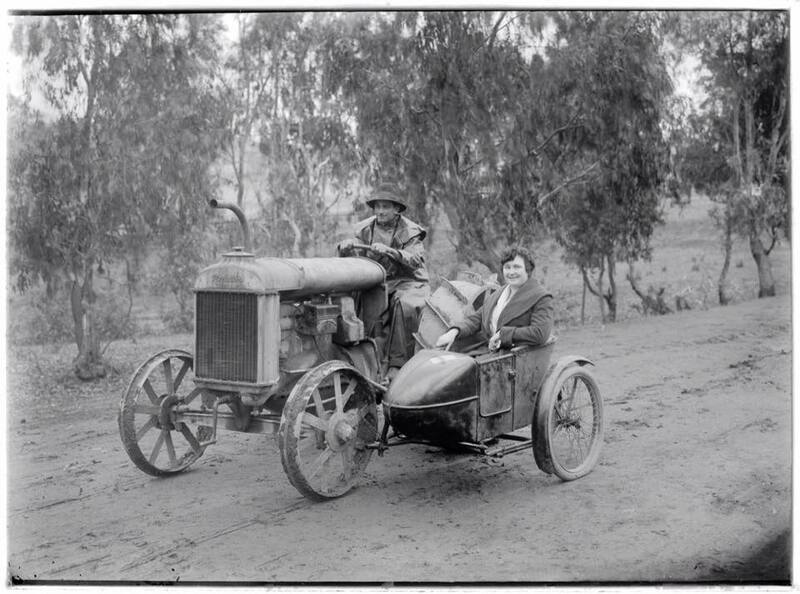 That first picture looks like a Fordson Speedster. 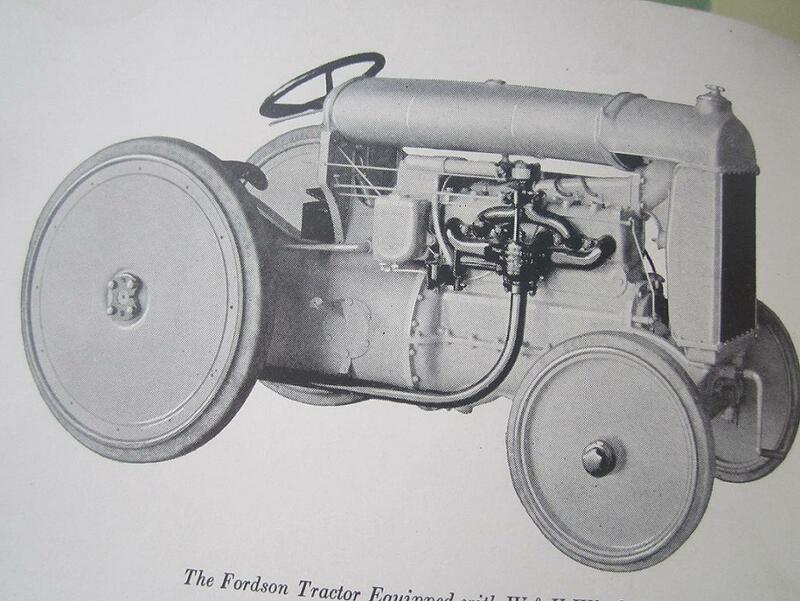 Interesting thread, My Fordson is one of the last Model F's (1927). It is interesting that the earliest tractors use the switch on the coil box. My tractor has a brass contact on the dash. 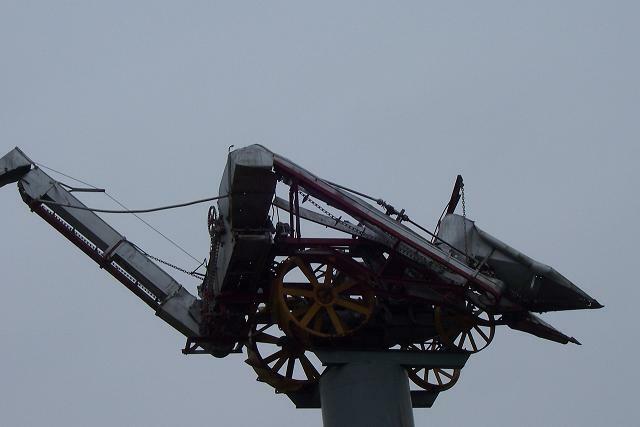 The contact is located at the end of the strip that the spark control lever rides on. The brass terminal is connected to the mag post. The terminal is insulated from the dash. To turn the tractor off you just move the spark lever from the advanced (running position) until it is seated on the brass contact. Once the spark lever makes contact with the brass it grounds the mag and shuts off the tractor. It is kind of a nice feature because if you leave the spark lever in the off position you must properly adjust the lever to start or the tractor will not fire. Helping to prevent broken arms! In the picture of my tractor below you can see the two wires leading from the mag post, one going to the coil box the other going to the brass contact. I will say that I don't like switching it off without gloves on, I have felt a little bite from the mag with bare hands. 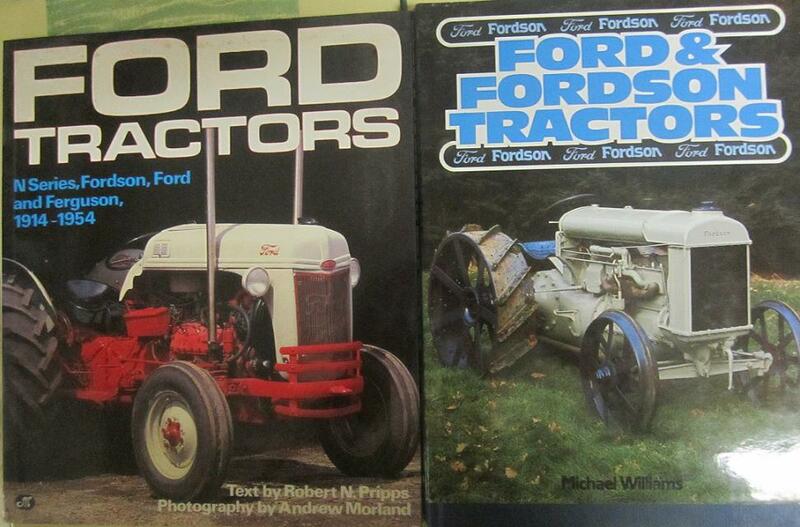 John, I have the book you pictured but I don't have the Fordson at work. I'll need to look for that one. Here are four more books, that have good sections on Fordsons. Both old and new photo's. This photo is one of them. WOW ! What an incredibly enjoyable thread! Thanks for the neat pics Dan and for all the other good information. And, howdy Fred Houston. I don't remember if the placard in front of the exhibit identified the Fordson at the Henry Ford as production #1 or experimental #1. Wouldn't either #1s require the little cast or forged coil box mounting brackets? My '19 Fordson correctly has a Model T coil box. You have to turn the switch to BAT on the tractor's left side and crank it then change to MAG then mount the tractor seat for work. All the Henry Ford Fordson #1 needed last 8/13 was a late '17-'22 Model T coil box and those little brackets. But their '14 T touring was pitifully incorrect too. I am enjoying your contributions to this thread. If you have not seen this footage that the Benson Ford Research Center has on their web site it is well worth a look. The footage is not that clear as it is only a preview and not a high definition copy. It runs for just over ten minutes. Two years ago my mom, wife and I were riding in the T and saw a sign for Maple syrup at a nearby farm. My mom wanted to stop so we drove in the yard and had a great conversation. Then the guy said he wanted to show me something in the barn. I was expecting to see an old car but he showed me two Fordson tractors that were in great condition. Since he is only about 2 miles from my house I'll have to go back the next time I go out with the T.
Oh yea The maple syrup was great! I don't have one, but I'd like to own one for around-the-house tasks. A feature of the Fordson that I have always believed was unique is the water bath air cleaner. It has a float inside, when the water got low it cuts off the air supply to the carburetor, shutting down the engine until the water level in the air cleaner is raised. John, thanks for the link. I have a few more things to post. My wife puts the pics on. She is away for a few days, so she will post them next week. Great thread. 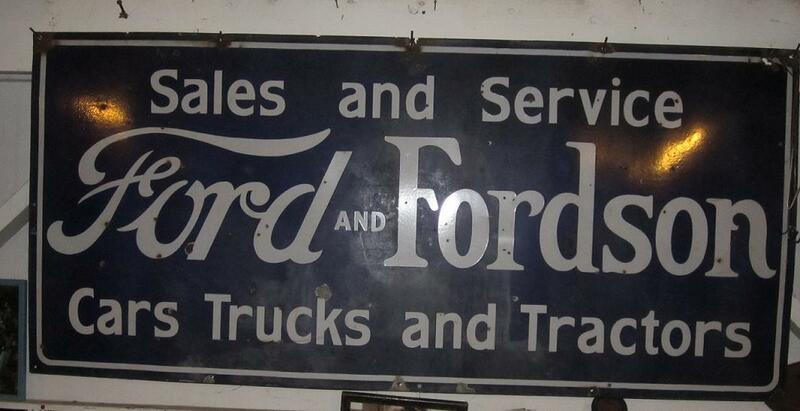 I love Fordsons! There should be a Chapter for them in the MTFCA! 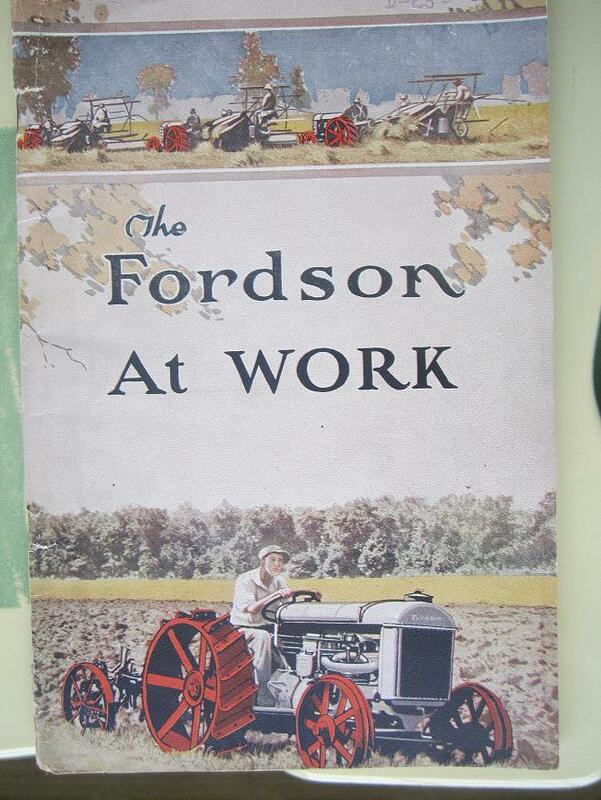 I am going to did out my Fordson literature now and look through it. 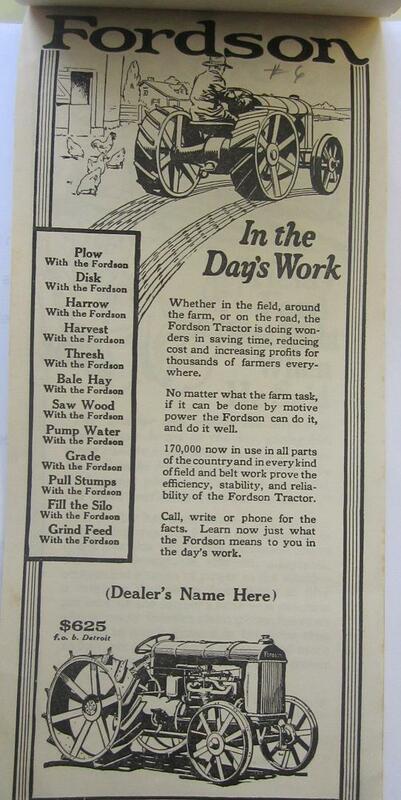 Unfortunately I haven't been close to any working Fordson, so I wonder how the gear shift is arranged? 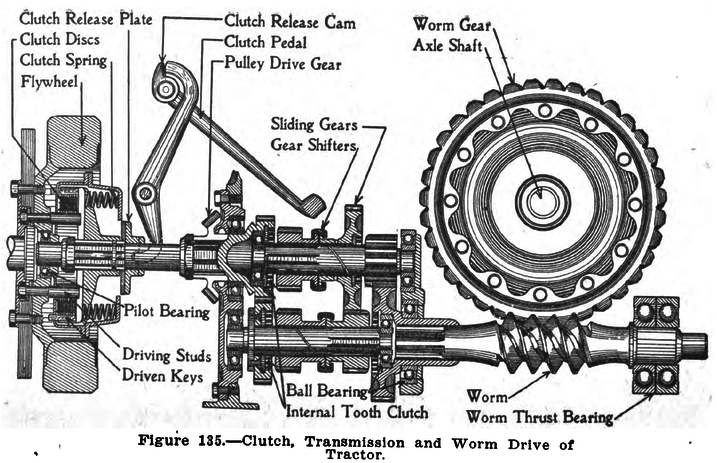 Roger - It is a sliding gear transmission, 3 speed forward one reverse, H pattern, Upper left low, Lower left reverse, Upper right 2nd, Lower Right 3rd. There is no brake pedal. Thanks Mike, I suppose there must be some kind of brake - is there a hand brake working on the rear wheels? 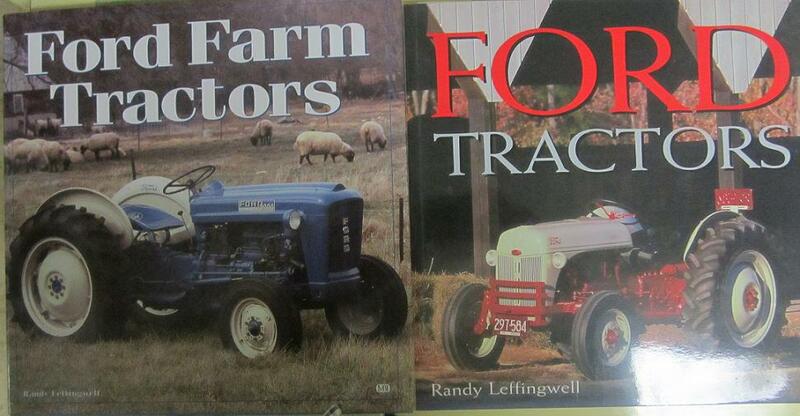 I don't know how many Ford tractor books Robert Pripps and Andrew Morland have published, but there's a lot of pictures in their books of my uncles', cousins', and grandfather's tractors in a bunch of them. 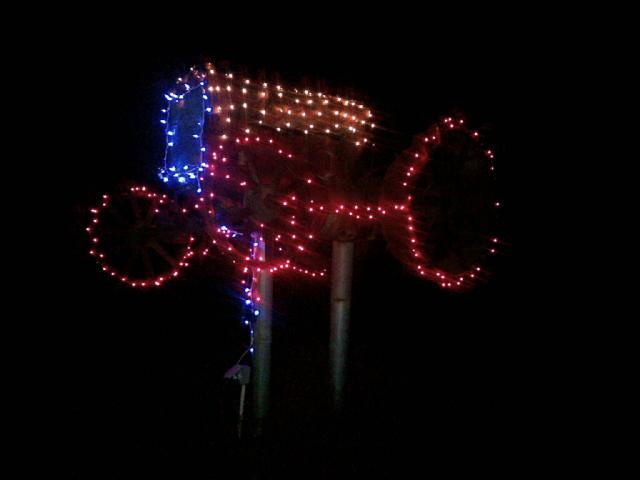 Grandpa's 1927 Fordson Model F is one of them. No brake! Here is a drawing of the transmission and rear end. 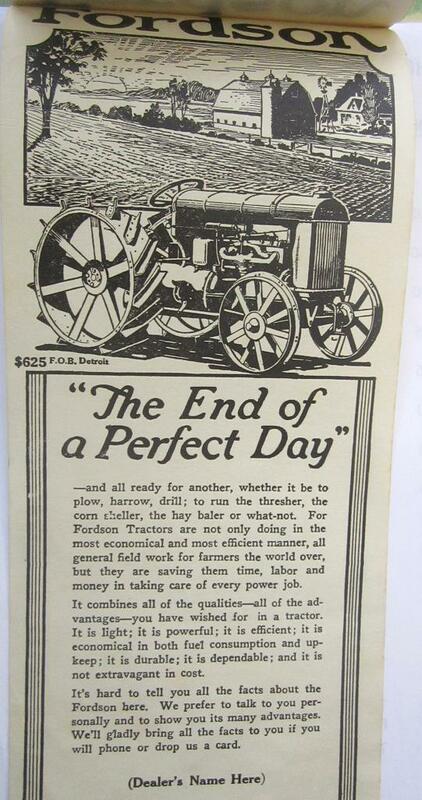 Whew, I can think about the horror being pushed downhill by a heavy load of firewood on a wagon behind the Fordson, freewheeling without being able to find a gear.. The Fordson does have a brake. It is activated by pushing the clutch pedal all the way down. Kind of a brake, not real efficient. 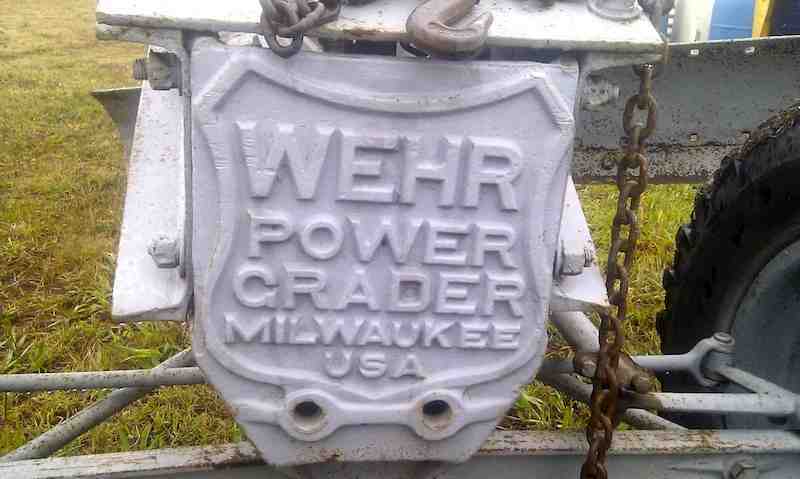 I don't think the transmission brake was available until about 1923. I have pulled loaded 100 bushel corn wagons with my tractor. I would not want to take it out of gear going down hill with that load. It will stop on flat ground with a load but it takes a while. Must have been a very considerate farmer who thought about his wife's comfort when they were going to town. The sidecar may be british. 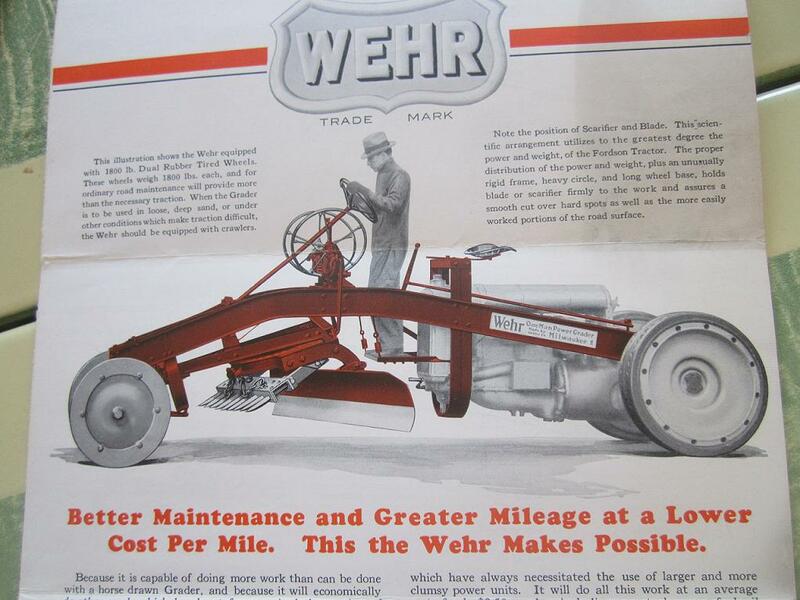 Mike, looking at your drawing my thought was could the Fordson use the same worm/ring that the one ton trucks used? Jerry, I don't know if they are interchangeable or not. Good question, someone else might know the answer. I would doubt it, but I could very well be wrong. The last two pictures are of a Ford service book. It has all types of equipment to work on T's, TT's, and Fordson's. Let's try it in Hungarian. Maybe the best one for last that I will post. These were taken at Model T Tour in Iowa, 2005 or 2006. 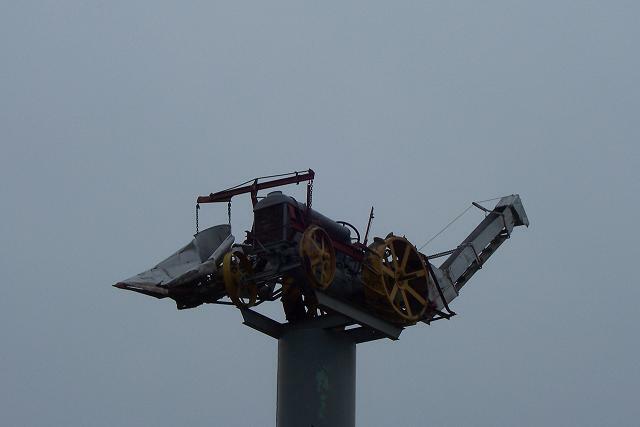 It was actually weather-vane, it turned with the slightest breeze. 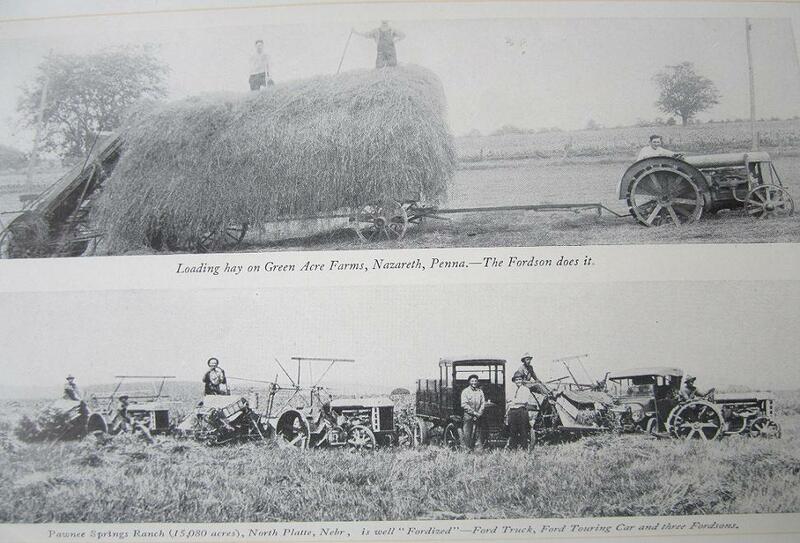 My favorite Fordson accessory is the Gleaner combine that fit over and around the Fordson. 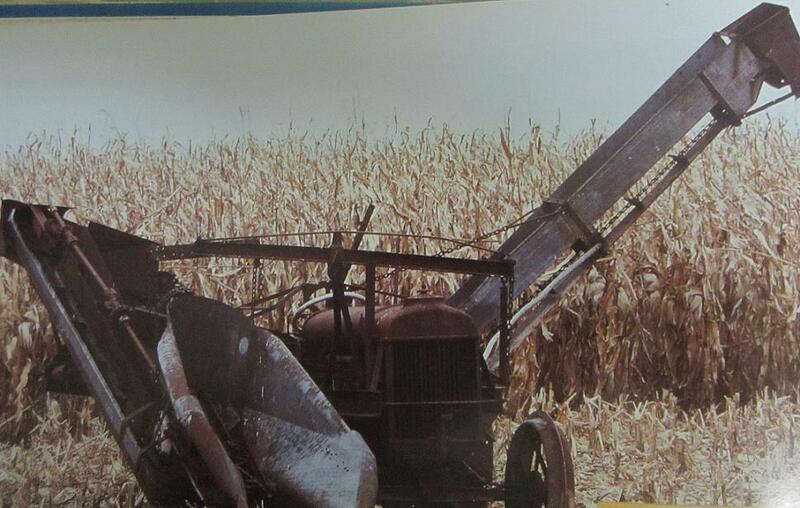 There is a photo of it that brought a lot of discussion last year on a thread about Kansas and combining wheat. There is one (or was) at the Montana Ag museum in Fort Benton, Mt.